Well things seem to be a bit quiet on Planet BDS land these days. The last big announcement I can see on the BDS Central web site has to do with the Quakers, and (as noted here), we have yet to hear from any of those crowing boycotters as to why – if their victory is so absolute – they needed to wrap it in the vaguest (and seemingly misleadingest) wording imaginable. You know, at this point I think it might be time to formalize criteria for success of a boycott, divestment or a sanctions activity, just so everyone involve with either fighting for or fighting against such an action will know what they are dealing with. And the best and simplest standard I can think of (one I’ve mentioned a few times in the past, albeit informally) would be as follows: we will all agree that a boycott, divestment or sanctions decision has been made when the people who are allegedly making this decision stand up and say that they (1) are boycotting, divesting from or sanctioning Israel and (2) are doing so specifically in protest of Israel or its policies (also specified). This standard really shouldn’t be considered extraordinary in any way. After all, in every boycott and divestment campaign that has ever existed (from the Montgomery bus boycott to the protests against Apartheid South Africa), it was the people doing the boycotting or divesting that took center stage, announcing what they had done and why. Certainly activists from inside and outside those communities (be they colleges, churches or other institutions) played a role in getting those organizations to join in a boycott or divestment campaign. But when it came time to announce success, it was the President of the College, the governing board of the church, or some other person actually responsible for the decisions that were being claimed to get up on stage, tell the world what they did, and announce in no uncertain terms that those boycott and divestment decisions were taken for specific political reasons. In fact, the anti-Israel BDS program seems to be the only example I can think of where people who did not make these decisions insist on the right to make claims regarding someone else. Whether we’re talking about Students for Justice in Palestine pretending to speak for Hampshire College (while the real decision-makers at Hampshire were saying something completely different) or BDS Central interpreting for us a series of unrelated decisions made by the Quakers, time and time again we’ve been faced with self-serving external groups telling us what we should believe another institution has done while the institution itself is remains mum on the subject or is saying something that completely contradicts what the boycotters are saying. So the next time you see a BDS press release announcing this or that retailer has kicked this or that hummus off their shelves, or this or that church or government council has cancelled a contract at the urging of boycott and divestment forces, everyone’s first response should be: Prove It. And in this case, proof can only come from one place: from a spokesperson from the organization allegedly doing this boycotting saying in no uncertain terms that they have done so for the specific political reasons assigned to them by the BDSers. This new standard is really in everyone’s interest (including the Israel haters). For Israel’s supporters, it provides an objective standard to ascertain the real progress (or lack thereof) of the BDS campaign so that resources to fight it can be applied appropriately. For institutions being targeted by the BDSers, it provides them a way to clearly state what they are doing and not doing (to avoid being criticized for something they didn’t do, for instance). And for the public, it ensures they are getting honest and accurate information. Even inhabitants of Planet BDS will benefit from such a standard since it would help them avoid another decade of being exposed as liars and frauds attempting to pass off one BDS hoax after another or trying to flummox the public through manipulative wording regarding other people’s choices. With such a standard in place, they will know exactly when an institution has joined their movement and will no longer need to hide their faces when their hoaxes are exposed (since there will no longer be any). So what do you say, world? Shall we all agree that the only way we’ll know when Harvard or the Quakers or the sandwich shop down the street has BDSed is when they tell us they did? Seems an obvious choice for me. 14 Responses to Prove It! I expect your statement here will stimulate loudly chirping crickets. Actually, Jon, you're the only one still questioning the legitimacy of the Quaker divestment decision. Even Front Page Magazine and the Times of Israel, among other anti-BDS websites, are reporting that the Quaker divestment was motivated by the companies' ties with Israel. If you feel so strongly that this is all one massive conspiracy, perhaps you should encourage these websites to publish articles fitting your warped and delusional positions. On the other hand, that would mean that you would have to compromise your own website's monopoly over the aforementioned views (namely, the refusal to acknowledge any BDS victory, ever), so I'd personally advise against it. So FrontPage and Times of Israel are the sources you are telling us we should all believe? I supposed we could go down that route, especially since it means we should also believe anything else these important sources you are pointing us towards say including FrontPage's assertion that “Anti-Israel divestment activity has largely been a dud” (an assertion that appears in the very same article you insist we use as a source). But my point in this posting is not to affirm or deny what the Quakers (or anyone else) did or didn't do. Rather, it simply provides a way to avoid ambiguity by asking BDSer to give us the same type of evidence every other boycott and divestment campaign in history has been able to generate without such a fuss: public statements from the person or organization that has allegedly made this boycott decision for the specific reasons assigned to them by you and your allies. Perhaps you have such information (not quotes from third parties, and not interpretations of decisions from subgroups with an agenda, but statements from the organizational and financial leaders who made these decisions saying that they were made not for general anti-war or environmental reasons, but specifically in protest of Israel). Provided such information, I can (as I have in the past) acknowledged when there was a genuine BDS victory at Israel's expense (such as the 2004 PCUSA decision). But given the track record of your “movement” for passing off general business decisions as BDS motivated (hoaxes that have been exposed time and time again), I really think it is in the interest of everyone (including you) that BDS plays by the same set of rules every other political movement uses (if only to avoid the perception that your victories only take place in your own version of reality). The timing should be mentioned as well. Statements specifically linking the decision to Israel, made by recognized leaders -not by an anonymous webmaster), on weekdays (not like thieves in the night who take advantage of a four day Jewish holiday celebrations when reactions are unavailable or a national holiday when the executives are unavailable to confirm or deny. Have all the protestant denominations lost their mind? As I have stated repeatedly on this blog -there are religious wars going on: intra-Christian, intra-Jewish, intra-Muslim and to top it off, a declared Islamic war of conquest on the West. All this using Israel as an alibi. Anyone who hasn't noticed should wake up and start talking about it. I attended a lecture on democracy in the Arab Spring states last night given by a pro-democracy activist from Tunisia, one Mohsen Marzouk. The interesting thing about this was that Israel only came up once, and only in passing and in response to a question from the floor. And it was only because of Israel's border with Syria, nothing else. That is, not everyone in the region (or anywhere else) sees Israel as THE problem, the solving of which (ie eliminating Israel) will surely bring POE & goodwill to all – to say nothing of Islamism forever for all of the region. Sorry, but that's from Brian, not Ros: still can't get the naming thing to work! It seems unlikely that BDS will adopt these clear, fair, and reasonable standards, since, as you have pointed out, their goal is not to actually have any economic effect on Israel but rather to get the words 'Israel' and 'apartheid' associated together in peoples' minds. It's not for BDS to adopt or not to adopt. It's for people of conscience and lovers of the truth to distinguish between truth and their lies. “The Board of the Utrecht Regional (BRU) has decided to grant the concession for the tram and bus in the city and region Utrecht to Qbuzz. On its website (www.regioutrecht.nl ) BRU states that the other candidate for public transport “OV Utrecht region” also had presented a very good bid. Of course they would have to say so, but we as U4P are satisfied that our campaign yielded a positive result thanks to all our phone calls, petitions and participation in the General Board meeting of the BRU. We U4P did this to prevent the other candidate to get the concession. “OV Utrecht region 'is actually Connexxion together with the GVU which is the current operator of the tram and bus in Utrecht. These two companies have since 2011 been taken over by Veolia, the international group that violates international law in many ways, and profits from Israel’s occupation of Palestine. Many thanks to all who have contributed to U4P’s campaign, especially the BNC and the Civic Coalition for Palestinians Rights in Jerusalem! Google translation : The award to Qbuzz follows the European tender for the urban and regional in the Utrecht region. The current concessionaire Connexxion / GVU and Qbuzz described in the auction. According to a scoring both offers tested for quality and price. Both offers met the requirements but on the basis of price and quality came Qbuzz higher, according to the regional board. Another BDS hoax concocted by the BDS cult. Psssst. Don't tell anyone. Its a secret. 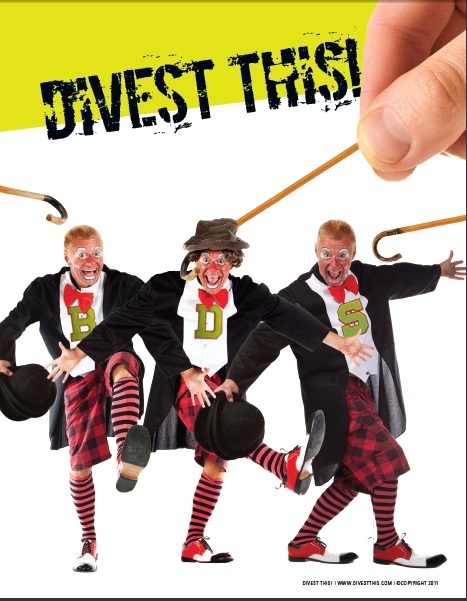 Boston Veolia is next in the BDS'er's crosshairs.